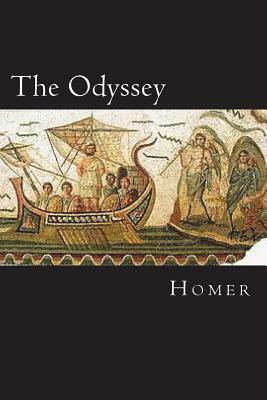 The Odyssey begins after the end of the ten-year Trojan War (the subject of the Iliad), and Odysseus has still not returned home from the war. Odysseus' son Telemachus is about 20 years old and is sharing his absent father's house on the island of Ithaca with his mother Penelope and a crowd of 108 boisterous young men, "the Suitors," whose aim is to persuade Penelope to marry one of them, all the while reveling in Odysseus' palace and eating up his wealth. Odysseus' protectress, the goddess Athena, requests to Zeus, king of the gods, to finally allow Odysseus to return home when Odysseus' enemy, the god of the sea Poseidon, is absent from Mount Olympus to accept a sacrifice in Ethiopia. Then, disguised as a Taphian chieftain named Mentes, she visits Telemachus to urge him to search for news of his father. He offers her hospitality; they observe the suitors dining rowdily while the bard Phemius performs a narrative poem for them. Penelope objects to Phemius' theme, the "Return from Troy," 6] because it reminds her of her missing husband, but Telemachus rebuts her objections, asserting his role as head of the household.